I shouldn't really say the "proper" way, as there really isn't a proper way to do anything in the garden. But, after a decade of experimentation, it is by far the best method I have found for dealing with the bewitching little things. You may have other methods, but I doubt any will be quite as effective as this one. The first critical thing is to order them from catalogs. There are practical reasons for this (price, selection, quality) but the real, essential, reason is that you can do it curled up comfortably on your couch with a hot cup of tea, gleefully circling things -- SO much more pleasant than standing in a garden center looking at bins of bulbs. It is also critically important to order your bulbs are early in the year as possible, for a reason I will explain in a moment, and this can't be done at the garden center. So order from catalogs. To order successfully, you need to do two things: Order a lot (roughly twice as much as any reasonable person would) and order from a really great catalog. Choosing a great catalog is a matter of taste. There are many companies with excellent selections and prices, but when curled up on the couch circling things, what really matters most is how well they are written. Every year I also get catalogs from companies whose names I can't remember with extremely low prices and garish, horrible photographs that describe each and every variety as "Amazing!" These catalogs go straight into the trash. White Flower Farm is lovely, but over-priced and feels a bit snobbish without an extensive selection to back it up. Like a restaurant where you can't wear jeans, but the food isn't any better than the local diner. I always start to look through Brent and Becky's Bulbs, because they have a great selection, but the prose and photography are both so poor it kills the mood, leaving me to indulge in my long-time favorite, McClure and Zimmerman. No photos, which allows for more fun imagining things, and clear, simply worded descriptions. I read it over and over, making list after list of things I simply must have. This is very hard to do, but very important. The first few years I gardened, I couldn't pull it off, but I've gradually become quite talented at it (I'm told it will only get easier as one gets older). I order as soon as possible and as much as possible, and once I'm done I throw myself into other gardening tasks and never, never, never look back at any bulb catalogs. As fall comes along, and you start seeing bulbs for sale at the grocery store, it is tempting to try and remember what you ordered, but resist! Keep thinking about asters and mums or your fall crop of lettuce and put bulbs out of your mind. If you succeed, one day, you will find a big, surprisingly heavy box has arrived. You know it is full of bulbs but you don't know what bulbs they are. It is like Christmas, only better, because you needn't worry that you won't like it. You spent weeks picking them out, they are sure to be perfect, but what, oh what could they be? My Big Box of Bulbs arrived last week and OH! It was exciting. I opened it carefully, then spent the next 10 minutes pulling out package after packaging and going "Princess Irene! OH! MORE Princess Irene! I LOVE her!" and "I can't believe I got SO MANY dwarf irises! I'm going to force a bunch of them. Oh my god! I got ANOTHER dozen of 'Harmony!'" and doing little happy dances all over the place. I didn't go quite so far as to kiss any of them, but I certainly thought about it. By the way, it is best, if possible, to do this alone. Non-gardening friends and relations who don't know that 'Princess Irene' is the most gorgeous tulip in the history of the world, a decidant orange shot with purple, won't understand the happy dances and tend to make unfortunant comments like, "How much did you SPEND on all of this?" and "Where are you going to plant them?" So, if at all possible, be alone. If not, simply ignore these comments. They are perfectly reasonable, and reasonable is the exact opposite of what you should be when dealing with bulbs. That is how your order bulbs. Or how you do it if you are not at all sensible. Sensible people, no doubt, do it very differently but I personally wouldn't be sensible about bulbs for anything. Sensible people work very, very hard to order just the right amount of bulbs to respect their budgets [and what they order is never enough]. Sensible people know exactly where they are going to plant everything and then they are disappointed in Spring when the planting pattern doesn't work out. However, the really sensible people, as you have here warned about, never, never let anyone see what bulbs they are buying or what bulbs have just been delivered. The "anyones" just don't get it; and never will. That is one of the many reasons that gardeners prefer to share their passion with other gardeners rather than with their closest friends and relatives. Oh Joseph, I saw that title and felt rebellious and defensive, certain I wasn't doing it properly, as that's my usual state. I should have known better - thinking of you dancing about on receipt of long ago ordered and forgotten bulbs made me smile. I wish I didn't let my budget rule my bulb ordering this year. Because it wasn't as fun as you suggest due to the fact that I had money at the back of my head. Maybe they should not include prices, ever, and charge my credit card, and I'll never have to know. Thanks for posting this. I just bought Crocus Sativus from M&Z, I'm so excited!! I can just see myself harvesting saffron!! I think you missed one crucial step. In the fall visit your favorite local garden center (or in my case Messelaar bulbs, even more dangerous) and buy more, forgetting that you've already ordered over 200 bulbs and sometimes getting more of what you've already ordered or already have in the ground. My husband thinks I should know where each bulb is going before I order them. If I show him a nice picture from a catalog the first thing he says is "where is that going?" Thanks for the pep talk...I always run out of steam in the fall and fail to plant more bulbs...and I ALWAYS regret it the next spring. I guess I don't qualify as any sort of sensible then... I admit I did my bulb arrival happy dances in front of my non-gardening partner. He did ask awkward questions about money and where I would plant them, but I ignored it. Despite what I write, I'm in grad school and DO have to worry about the budget. I try to make up for it by limiting the number of expensive bulbs (lilies, fritillaria, etc) I buy and going wild on the cheap ones like crocus, scilla, and anemone. Good luck with the saffron! I've bought them several times but never gotten the darn things to flower... too wet in the summer here, I think. Yeah... the extra bulbs at the garden center are always good too. 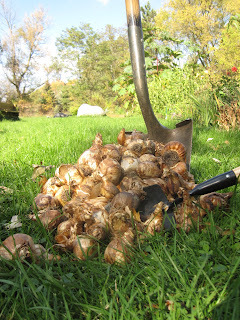 So far I have resisted this year, but there are still weeks of bulb planting weather left! For shame! Always plant bulbs. Always! When I bought my house, the FIRST thing I did after signing the papers, before I even went inside, was plant crocuses. A delightful article from a delightful, talented gardener! Thanks Joseph! I just planted some bulbs! So excited! Do you water your bulbs after you plant them? If so, when do you stop watering for the winter? Meems, I don't water after planting, because the fall here is very rainy, so I don't need to. If I lived somewhere drier... I'd probably give them a good soaking after planting, and then let them do their thing. Castor beans: From "meh" to "oh YEAH"